Alfred Junge , in film from 1920 as art director at Berlin's UFA studios, came to Britain in the mid-1920s with director E.A. Dupont , and spent the rest of his career there. He headed Gaumont-British 's production department between 1932 and 1937 at a time when its head, Michael Balcon , was trying to compete with Hollywood, and where his craftsmanship and technical expertise influenced many British directors and other technicians. At Gaumont-British , Shepherd's Bush Studios , he gave a distinctive look to such generically diverse films as The Ghoul (d. T. Hayes Hunter, 1933), the wonderfully glamorous Jessie Matthews musical, Evergreen (d. Victor Saville, 1934), and to several Hitchcock thrillers, and, at MGM-British , to the nostalgically recreated public school world of Goodbye, Mr Chips (d. Sam Wood, 1939). 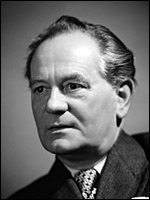 His greatest artistic triumphs, though, were his collaborations with Powell and Pressburger in the 1940s, particularly A Matter Of Life And Death (1946), with its "staircase to Heaven" and celestial court, and the Oscar -winning Black Narcissus (1947), the latter magically recreating the Himalayan convent in Pinewood and Horsham, Surrey. Michael Powell later rated him as "probably the greatest art director that films have ever known". In the 50s he headed MGM-British 's production department, responsible for transatlantic productions such as Ivanhoe (d. Richard Thorpe, 1952). Book: Accent on Design: Four European Art Directors by Catherine A. Surowiec (1992).